Devastated by the assassination of Dr. Martin Luther King Jr., Cardinals pitcher Bob Gibson still fulfilled his professional obligations and pitched the day after King’s death and the day after King’s funeral. King was murdered on April 4, 1968, in Memphis. The civil rights leader and clergyman was 39. In his 1968 book “From Ghetto to Glory,” Gibson said he was in his room at spring training camp in St. Petersburg, Fla., when he thought he heard a television report about King’s death. 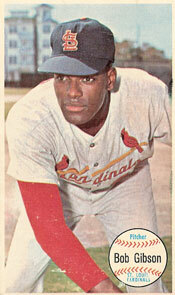 Uncertain of what he heard, Gibson went to teammate Lou Brock’s room. “Orlando Cepeda was there and from the expressions on their faces I knew I had heard correctly,” Gibson said. On Friday April 5, the day after King’s death, the Cardinals and Tigers proceeded with a scheduled spring training exhibition game at St. Petersburg. Gibson and another black pitcher, the Tigers’ Earl Wilson, were the starters. “Everybody on the club was dismayed by what happened to Martin Luther King. It was a very disorienting time in many respects and that was probably the hardest moment. Bob and I had a very serious discussion in the clubhouse that morning. He was very emotional and initially he turned his back on me. “Probably the last person he wanted to talk to that morning was a white man from Memphis, of all places. But I confronted him on that, as I knew he would have done if the tables had been turned. I told him that I had grown up in an environment of severe prejudice, but if I were any indication, it was possible for people to change their attitudes. On the afternoon of April 5, Gibson pitched four innings against the Tigers and yielded a run on three hits. He also drove in a run with a sacrifice fly. McCarver caught and also produced two singles and scored a run. The Cardinals won, 3-2, on Bobby Tolan’s ninth-inning RBI-single. The Cardinals and Tigers played again the next afternoon, April 6, in a game won by Detroit, 4-2, at Lakeland, Fla. Brock led off the game with an inside-the-park home run. President Lyndon Johnson declared Sunday, April 7, a day of national mourning for King. All spring training exhibition games were canceled that day. The 1968 major-league regular season was scheduled to begin with three Opening Day games on Monday April 8 and eight more openers, including the Braves vs. the Cardinals at St. Louis, on Tuesday April 9. King’s funeral was April 9 in Atlanta. Gibson said some Cardinals players gathered in Cepeda’s apartment and decided to inform Cardinals management they wouldn’t open the season as scheduled. But, before the players expressed that view, the major leagues moved back the entire slate of openers to Wednesday, April 10. Cardinals general manager Bing Devine said it was a time “when unity of thinking, purpose and action is desirable,” the Associated Press reported. A day after King was buried in Atlanta, the Atlanta Braves faced the Cardinals before 34,740 at Busch Stadium. Among the prominent African-American players in the lineups were Gibson, Brock and Curt Flood for the Cardinals and Hank Aaron for the Braves. Gibson never hesitated in making the start in the 1968 opener. “As disturbed as I was about Dr. King, I knew, also, that I couldn’t let it undermine my pitching,” Gibson said. The 1968 season turned out to be Gibson’s greatest. He was 22-9 with a 1.12 ERA, pitched 13 shutouts and won both the Cy Young Award and the Most Valuable Player Award in the National League.